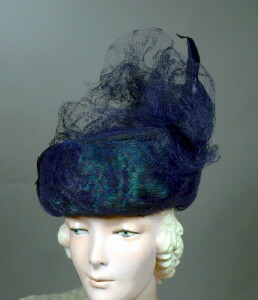 Lavish 1910's vintage toque hat with veiling. Deep dark teal & navy blue feathers, black velvet, navy blue intricate geometric pattern veiling. Black velvet dome crown hat covered with feathers. Veiling is wrapped generously around roll back brim with large poufy bow. Navy stand feathers with black velvet ribbon. Black cotton sateen lining with crown center drawstring for adjusting. Magnificent crowning glory!! Crown height front - 4"
Feather height - 6 1/2"
Inner crown width from side to side - 6 1/2"
Inner crown length from front to back - 7 1/2"
Inside crown circumference - 22 1/2"